Bounded by: North Terrace, King William Road, Frome Rd, Pennington Tce and Sir Edwin Smith Ave.
Take APPA's self-guided walk through Park 12, using this link to the National Trust's "Adelaide City Explorer" app or website. 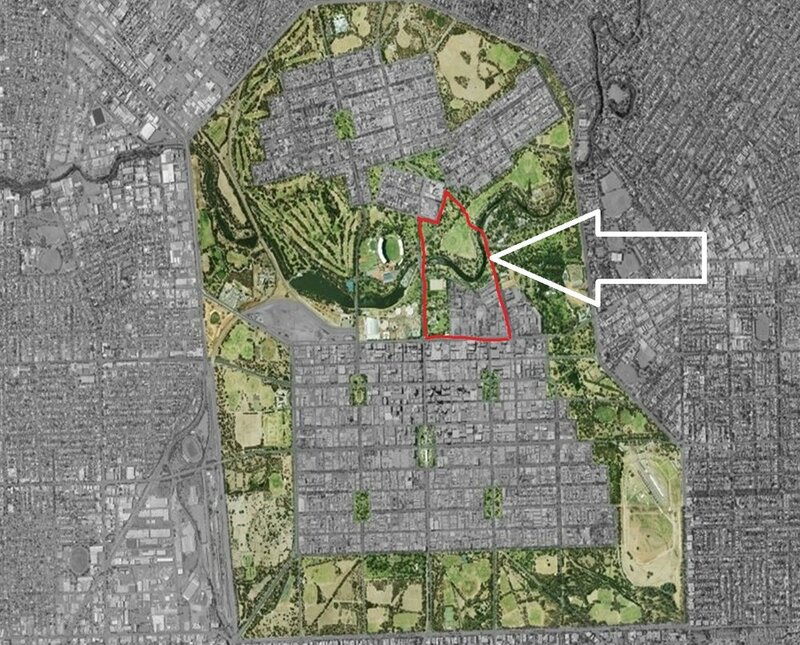 Red Gum Park / Karrawirra (Park 12) usually refers to the area north of Victoria Drive but historically, much of the University precinct (the area greyed-out inside the red boundary above) between North Terrace and Victoria Drive was once Park Lands as well. Land between Victoria Drive and North Terrace gradually disappeared as Park Lands, over a period of many decades after the Adelaide University was founded in 1875. Park 12 on Google Maps. Adelaide City Council's Park 12 web page.